I’ve spent my whole life in Buffalo, and growing up, it didn’t take me a long time to realize that food is central to our city. With the wide array of cultures and experiences our city offers, it’s usually difficult for me to be surprised about a restaurant. 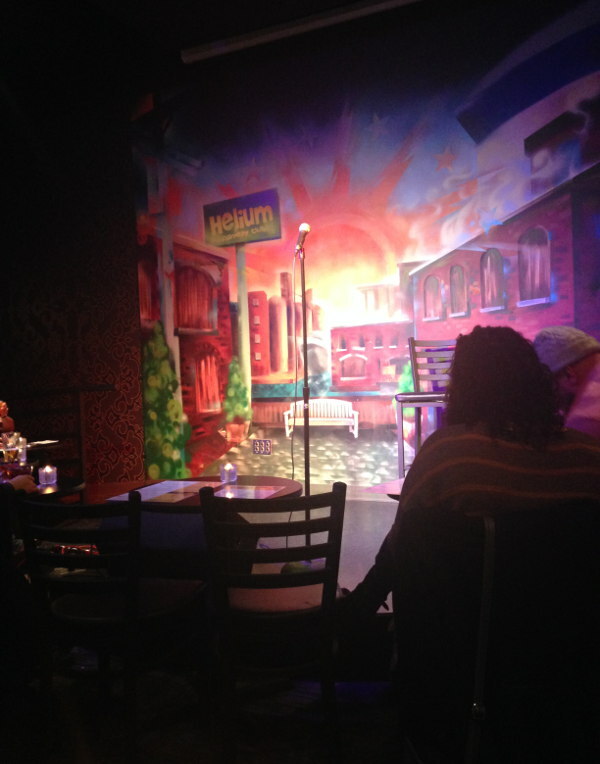 Within the last year, however, I’ve discovered a venue that’s worth visiting and re-visiting: Helium Comedy Club, on 30 Mississippi Street, allows us to experience an eclectic fusion of food, drink, and of course, high-quality comedy. I arrived at 9:30 p.m. on a Saturday night to see a performance by Ted Alexandro, NYC-based comedian. Before that night, I had already been there four times within the past year, though, this night was especially packed. 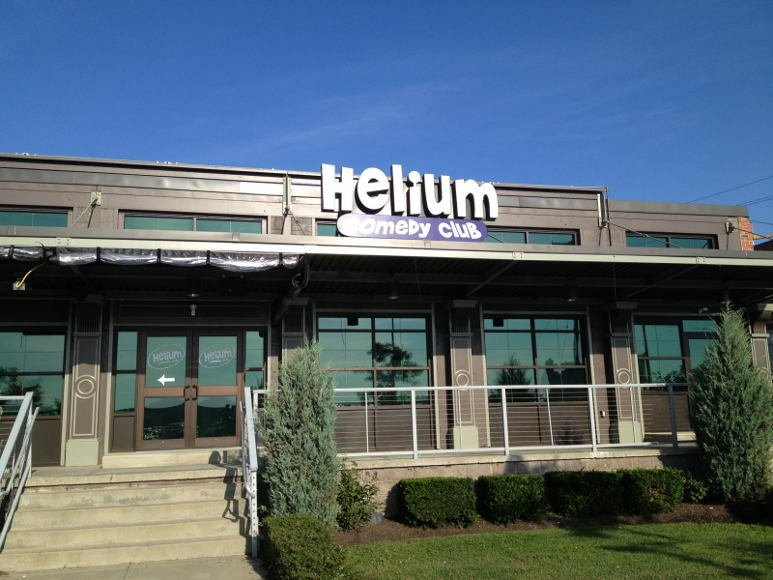 Helium Comedy Club is divided up into two parts: Elements Bar, and the showroom/restaurant itself. 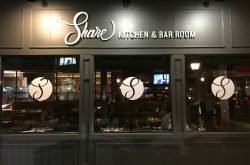 Technically, you can have a wine-and-dine experience just at the bar, separate from the actual showroom. 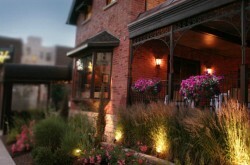 Elements Bar is both rustic and modern, decorated with tasteful simplicity. As such, it’s a perfect place to have a few drinks and appetizers before the show starts. 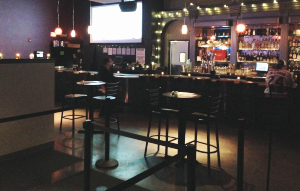 Although the bar fills up fast, it’s plenty spacious, and has seating for singles, couples, or groups. I went with two of my friends; before the show started, we waited by the bar and talked, and everyone around us seemed to be doing the same. The atmosphere of the bar is vibrant and full of energy, and the staff is equally as lively as the customers they serve. The room itself brims with vivacity, both emitting from the people and the music. Above the bar sits a TV, which typically has sports on (in case you need to quickly check any scores before the show starts!). Around 10 p.m., we were called into the showroom to be seated. The restaurant inside the showroom, however, is an entirely different experience than the bar. The showroom is equally, if not more, spacious than the bar; it is somewhat divided into two levels: the level closest to the stage is slightly lower than in the back of the room so that those in the back can see the stage. My two friends and I were lucky enough to be seated close to the stage—almost directly in front of it—which made our experience that much more magnetic. The room is quaint and dimly-lit (for obvious reasons); similarly to the bar, the showroom is decorated simply, with little candles on each table so that we could read the menu. We had a few minutes to settle in before the show started, and were promptly greeted by a friendly waitress. In fact, what I find most impressive about the venue is its staff: it’s not an easy job to navigate a dark, crowded room—and on top of that, the waiters and waitresses have to take orders quietly enough as not to disturb the show. All of the servers, in addition to being charismatic, were incredibly professional. Helium’s menu offers quite a few different options, ranging from drinks and appetizers to dinner and dessert. 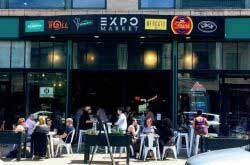 The venue has a two-item minimum per customer: if you do not choose to order anything, you will be charged for the price of two drinks. Usually when I go with friends, we stick to appetizers, and often share with each other. Some of my favorite appetizers are the fries (though it may sound typical, they’re seasoned deliciously! ), the Mediterranean platter, and the Spinach and Artichoke dip with tortilla chips, which you can have with salsa, as well. That night, I decided to go with the Classic Buffalo Beef on Weck, a favorite of mine. I was offered the choice of chips or fries, and I went with the chips. My two friends ordered different salads (there are three salads on the menu, if you’re looking for a healthier option). We ordered our food and drinks before the actual show started—I would suggest doing that when you go, because it takes a little longer for the wait staff to get to you when the show is up and running. If you’re not interested in having dinner or appetizers, coffee and dessert is always an option. Helium’s dessert menu is a sweets-lovers’ dream: they make “Peanut Butter Fudge Swirl Pie,” “Handmade Ice Cream Sandwich,” “Apple cobbler,” or “Supreme Brownie Sundae.” I’ve tried most of these desserts, and they’re always yummy and satisfying. However, the wait staff has told us that they will be soon changing the menu, and that we can look forward to more options: all of which, I’m sure, will be equally as delectable. With acts ranging from local Buffalo comedians (who are always hilarious!) to nationwide celebrities, like Marlon Wayans, Jim Breuer, Ian Karmel, and Jen Kirkman, what are you waiting for? There’s even chances to attend free open-mic nights, if you’re feeling bold and experimental or just want to be entertained. 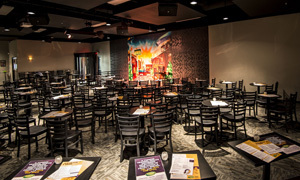 Helium Comedy Club is a foolproof way to spend the night out, and will inevitably leave you in high spirits when you leave.